Fleet Admiral William Daniel Leahy (May 6, 1875 – July 20, 1959) was an American naval officer who served as the senior-most United States military officer on active duty during World War II. He held multiple titles and was at the center of all the major military decisions the United States made in World War II. 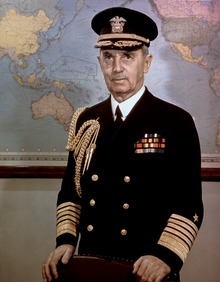 As Chief of Naval Operations from 1937 to 1939, he was the senior officer in the navy, overseeing the preparations for war. After retiring from the navy, he was appointed in 1939 by his close friend President Franklin D. Roosevelt as Governor of Puerto Rico. In his most controversial role, he served as the United States Ambassador to France 1940–42, but had limited success in keeping the Vichy government free of German control. Leahy was recalled to active duty as the personal Chief of Staff to President Franklin D. Roosevelt in 1942 and served in that position throughout World War II. He chaired the Chiefs of Staff and was a major decision-maker during the war. He continued under President Harry S. Truman until finally retiring in 1949. From 1942 until his retirement in 1949, he was the highest-ranking active duty member of the U.S. military, reporting only to the President. He was the United States' first de facto Chairman of the Joint Chiefs of Staff (not his official title) and he also presided over the American delegation to the Combined Chiefs of Staff, when the American and British staffs worked together. As fleet admiral, Leahy was the first U.S. naval officer ever to hold a five-star rank in the U.S. Armed Forces. The USS Leahy (DLG-16) was named in his honor. From an Irish-American family, Leahy was born in Hampton, Iowa, and moved with his parents to Ashland, Wisconsin, as a child. His father Michael Arthur Leahy (1838–1921) was a successful lawyer and Civil War veteran, and William had wanted to attend West Point and follow in his father's footsteps. However, after graduating high school in 1893 he attended the United States Naval Academy, graduating 15th in his class of 47 in 1897. Midshipman Leahy was assigned to USS Oregon, then in the Pacific. He was on that battleship when she made her famous dash through the Strait of Magellan, and around South America in the spring of 1898 to participate in the Battle of Santiago on July 3 during the Spanish–American War. This was the only battle Leahy ever saw in person. Having completed the two years of sea duty then required by law, Leahy was commissioned Ensign on July 1, 1899. At that time, he was on the Asiatic Station, where, during the Philippine–American War and the Boxer Rebellion in China, he served on Castine and Glacier and commanded the gunboat Mariveles. He returned to the United States in 1902 and became a member of the Military Order of the Dragon. For the next five years, he did duty on board the training ship USS Pensacola, Tacoma and Boston, which were stationed in Panama during the early period of construction of the canal. His first shore duty was at the Naval Academy. Beginning in 1907, he served as instructor in the Department of Physics and Chemistry for two years. He went to sea in 1909 and served as navigator of the armored cruiser California in the Pacific Fleet. On October 18, 1911, Lt. Cmdr. Leahy served as naval aide to President William Howard Taft, at the laying of the keel of USS Jupiter (AC-3), at Mare Island. During the American Occupation of Nicaragua in 1912, he was Chief of Staff to the Commander, Naval Forces there. Late in 1912, he came ashore in Washington as Assistant Director of Gunnery Exercises and Engineering Competitions. In 1913, he was assigned to the Bureau of Navigation as a detail officer, where he served until 1915. At that time, he took command of the dispatch gunboat Dolphin, and established a close friendship with the then Assistant Secretary of the Navy, Franklin D. Roosevelt, who cruised with him on the ship. He was in that assignment in early 1917 in West Indian waters and had additional duty as Senior Aide on the Staff of Commander Squadron Three of the Patrol Force Atlantic Fleet. Leahy served for almost a year as the Executive Officer of Nevada and in April 1918 went to command Princess Matoika, formerly Princess Alice, transporting troops to France. It was during this tour that he was awarded the Navy Cross. After a short cruise in that command, he came ashore in 1918 and served for three years as director of Gunnery Exercises and Engineering Competition in the Navy Department. He was also a senior member of the Fire Control Board. In 1921, he went to sea in command of St. Louis, flagship of the naval detachment in Turkish waters during the war between Turkey and Greece. At the end of that war, he was given command of Mine Squadron One, and in 1922 further additional duty as commander, Control Force. He returned to the United States, and from 1923 to 1926, he served as director of Officer Personnel in the Bureau of Navigation. For one year, he commanded the battleship New Mexico. In 1927, he reached flag rank and became chief of the Bureau of Ordnance. After almost four years, he went to sea in 1931 as Commander Destroyers Scouting Force. In 1933, Leahy came ashore in Washington as Chief of the Bureau of Navigation for two years. He went to sea as a vice admiral, and Commander Battleships Battle Force. In 1936, he hoisted his four-star flag on California as Commander in Chief Battle Force. He was appointed Chief of Naval Operations (CNO), took the oath of office in January 1937 to serve until August 1939 when he was placed on the retired list. On that occasion, President Roosevelt said "Bill, if we have a war, you're going to be right back here helping me run it." Before retiring as CNO, Leahy joined his wife Louise Harrington Leahy when she sponsored Cimarron, which was commissioned on March 20, 1939. From September 1939 to November 1940, Leahy served as Governor of Puerto Rico after Roosevelt removed Blanton Winship over his role in the Ponce massacre. Leahy oversaw the development of military bases and stations across the island while serving as governor. He took an open stance of not intervening directly in local politics, attempted to understand and respect local customs, and initiated various major public works projects in the island. While given the unflattering sobriquet Almirante Lija ("Admiral Sandpaper") by locals, based on his family name, he was regarded as one of the most lenient American governors of the several that served Puerto Rico in the first half of the 20th century. Leahy was appointed Ambassador to France (later referred to as Vichy France for the city in which the capital was located) in 1941 following that country's capitulation to Germany. Leahy relates in his memoir I Was There that (his) "major task was to keep the French on our side in so far as possible". He was recalled in May 1942. The United States supplied food and medical aid to the Vichy regime and to French North Africa, hoping in return to moderate Vichy collaboration with Germany and to avoid an open Vichy–German alliance in the Mediterranean. American aid proved too little to buy French support over North Africa. President Roosevelt and Admiral Leahy meeting with King Ibn Saud of Saudi Arabia, on board the USS Quincy. After the United States entered World War II, President Roosevelt decided he needed a senior military officer as personal adviser and point of contact with his three service chiefs, Admiral Ernest King of the Navy, General George Marshall of the Army and General Henry Arnold of the Army Air Forces. The service chiefs resisted this move until Marshall suggested that only Leahy would be accepted in this post. On July 6, 1942, Leahy was appointed Chief of Staff to the Commander in Chief, U.S. Army and Navy, the President of the United States. Leahy was also appointed to be the head of the Joint Chiefs of Staff, which would serve as the governing body of the U.S. Armed Forces, with the Chief of Staff of the U.S. Army, the Chief of Naval Operations of the U.S. Navy, which also had jurisdiction over the U.S. Marine Corps and the U.S. Coast Guard, and the Commanding General of the U.S. Army Air Forces also serving as members during World War II. Leahy spent D-Day, June 6, 1944, in his home town of Hampton, Iowa. This well-publicized "sentimental journey" was part of the deception efforts surrounding the Allied invasion of Europe. The idea was to lull any German agents in Washington, D.C., or elsewhere in the United States into believing that the operation would not take place while such an important officer was out of the capital. In July 1944, Leahy accompanied President Roosevelt to the Pacific Strategy Conference in Hawaii at which Roosevelt met Admiral Chester Nimitz (commander of the Pacific Ocean Areas) and General Douglas MacArthur (commander of the Southwest Pacific Area) to decide the course of the war in the Pacific theater. Leahy was promoted to the rank of Fleet Admiral on December 15, 1944, the most senior of the seven men who received five star rank in 1944. Leahy accompanied President Roosevelt as his personal aide to the Yalta Conference in February 1945. At Yalta Roosevelt met the British Prime Minister Winston Churchill and Soviet leader Joseph Stalin to decide how Europe was to be reorganized after the impending surrender of Germany. 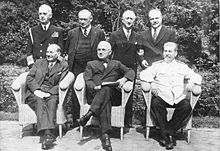 Five months later, he went with President Truman to the Potsdam Conference where Truman met with Stalin and the new British Prime Minister Clement Attlee to make decisions about the governance of occupied Germany. Once it had been tested, President Truman faced the decision as to whether to use it. He did not like the idea, but he was persuaded that it would shorten the war against Japan and save American lives. It is my opinion that the use of this barbarous weapon at Hiroshima and Nagasaki was of no material assistance in our war against Japan. The Japanese were already defeated and ready to surrender because of the effective sea blockade and the successful bombing with conventional weapons ... My own feeling was that in being the first to use it, we had adopted an ethical standard common to the barbarians of the Dark Ages. I was not taught to make wars in that fashion, and that wars cannot be won by destroying women and children. After mediating between the United States Navy and the Puerto Rican government over the involuntary transfer of part of the islands of Vieques and Culebra to naval authorities, Leahy again retired from the Navy in March 1949, though as an officer with five-star rank, he technically remained on active service. The following year, he published his war memoirs, I Was There. There is a bilingual book called Las memorias de Leahy: los relatos del almirante William D. Leahy sobre su gobernación de Puerto Rico (1939–1940) that lists his diary entries from Puerto Rico in both Spanish and English, which was published by the Luis Muñoz Marín Foundation in 2001. While serving on the USS Pensacola, which was based in San Francisco, Leahy met Louise Tennent Harrington, whom he married on 3 February 1904. During Leahy's tenure as Ambassador to France, his wife underwent a hysterectomy which could not be delayed until their pending return to the United States. While recovering in the hospital from the operation, Louise Leahy suffered an embolism and died with Leahy at her side on 21 April 1942. After a service at the St Thomas Episcopal Church, she was buried on 3 June 1942 in Arlington National Cemetery. William and Louise had children, including a son, William Harrington Leahy, who graduated from the U.S. Naval Academy in 1927. He engaged in pre-World War II naval intelligence. William H. Leahy retired from the U.S. Navy as a 2-star rear admiral in 1961. Leahy died at the U.S. Naval Hospital in Bethesda, Maryland, July 20, 1959, at the age of eighty-four. He was given an Armed Forces military funeral on July 23, 1959. His body was viewed at the Bethlehem Chapel at the Washington National Cathedral from July 22 noon until noon the following day. The funeral service was held in the cathedral at 1400 on July 23 and the burial was in Arlington National Cemetery. The gravesite is in Section 2, Lot 932, Grid R-31.5, about midway between Memorial Gate and the Arlington Memorial Amphitheater. Honorary pallbearers were Fleet Admiral Chester W. Nimitz, Admiral Thomas C. Hart, Admiral Charles P. Snyder, Admiral Louis E. Denfeld, Admiral Arthur W. Radford, Vice Admiral Edward L. Cochrane, and Rear Admiral Henry Williams, all retired from service. Active military servicemen who were honorary pallbearers were Admiral Jerauld Wright, Admiral Robert L. Dennison, Rear Admiral Joseph H. Wellings, and close friend, William D. Hassett. Note: Leahy was ineligible for the American Defense Service Medal as he retired from the Navy in August 1939 and was recalled to active duty in May 1942. The medal was for active service from 8 September 1939 to 7 December 1941. ^ U.S. officers holding five-star rank never retire; they draw full active duty pay for life. Spencer C. Tucker (2011). The Encyclopedia of the Vietnam War: A Political, Social, and Military History. ABC-CLIO. pp. 1685. ISBN 978-1-85109-961-0. ^ a b c "Arlington National Cemetery Website". William Daniel Leahy. Retrieved 2010-12-26. ^ Alexander, David (2007). The Building: A Biography of the Pentagon (1st ed.). St. Paul, Minn.: MBI. p. 52. ISBN 9780760320877. Adams, Henry H. Witness to Power: The Life of Fleet Admiral William D. Leahy (Naval Institute Press, 1985) 348 pp. Hall, George M. (1994). The Fifth Star: High Command in an Era of Global War. Westport: Praeger Publishers. ISBN 0-275-94802-1. Wikimedia Commons has media related to William D. Leahy. The Last Salute: Civil and Military Funeral, 1921–1969, CHAPTER XVII, Former Chief of Naval Operations, Fleet Admiral William D. Leahy, Special Military Funeral, 20–23 July 1959 by B. C. Mossman and M. W. Stark. United States Army Center of Military History. This page was last edited on 12 April 2019, at 17:12 (UTC).